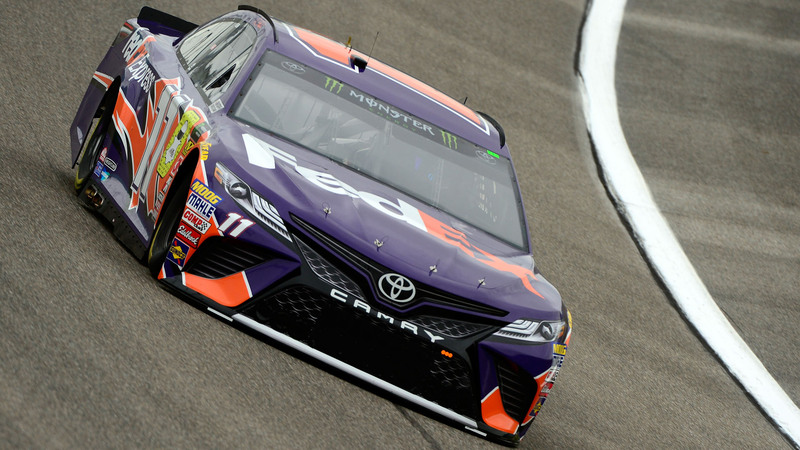 Denny Hamlin spoiled the party for the Championship 4 at qualifying Friday for the Ford EcoBoost 400 as he took home the pole over Kyle Busch, who qualified second. Each of the last four winners of NASCAR’s playoffs has won at Homestead-Miami Speedway while three of the last four have started inside the top five. Only Jimmie Johnson in 2016 started outside it (14th). None have started on the pole. Martin Truex Jr., the 2017 champion, will start third. Truex said that Hamlin winning the pole somewhat evens the playing field. Joey Logano will line up fifth and Kevin Harvick will start 12th. The Ford EcoBoost 400 can be seen Sunday at 3 p.m. ET on NBC. 1. (11) Denny Hamlin, Toyota, 173.863 mph. 2. (18) Kyle Busch (P), Toyota, 173.622 mph. 3. (78) Martin Truex Jr. (P), Toyota, 173.539 mph. 4. (2) Brad Keselowski, Ford, 173.433 mph. 5. (22) Joey Logano (P), Ford, 173.366 mph. 6. (41) Kurt Busch, Ford, 172.535 mph. 7. (20) Erik Jones, Toyota, 172.507 mph. 8. (31) Ryan Newman, Chevrolet, 172.430 mph. 9. (17) Ricky Stenhouse Jr., Ford, 172.403 mph. 10. (10) Aric Almirola, Ford, 172.353 mph. 11. (42) Kyle Larson, Chevrolet, 172.029 mph. 12. (4) Kevin Harvick (P), Ford, 171.942 mph. 13. (88) Alex Bowman, Chevrolet, 172.529 mph. 14. (9) Chase Elliott, Chevrolet, 172.518 mph. 15. (12) Ryan Blaney, Ford, 172.276 mph. 16. (3) Austin Dillon, Chevrolet, 172.243 mph. 17. (6) Matt Kenseth, Ford, 172.199 mph. 18. (19) Daniel Suarez, Toyota, 172.002 mph. 19. (48) Jimmie Johnson, Chevrolet, 171.953 mph. 20. (47) AJ Allmendinger, Chevrolet, 171.559 mph. 21. (1) Jamie McMurray, Chevrolet, 171.527 mph. 22. (21) Paul Menard, Ford, 171.369 mph. 23. (43) Darrell “Bubba” Wallace Jr. #, Chevrolet, 171.027 mph. 24. (34) Michael McDowell, Ford, 170.708 mph. 25. (38) David Ragan, Ford, 172.013 mph. 26. (14) Clint Bowyer, Ford, 171.827 mph. 27. (37) Chris Buescher, Chevrolet, 171.233 mph. 28. (24) William Byron #, Chevrolet, 170.800 mph. 29. (32) Matt DiBenedetto, Ford, 170.498 mph. 30. (95) Regan Smith, Chevrolet, 169.715 mph. 31. (13) Ty Dillon, Chevrolet, 169.651 mph. 32. (00) Landon Cassill(i), Chevrolet, 168.951 mph. 33. (23) JJ Yeley(i), Ford, 167.198 mph. 34. (72) Corey LaJoie, Chevrolet, 167.002 mph. 35. (99) Kyle Weatherman, Chevrolet, 166.898 mph. 36. (51) BJ McLeod(i), Ford, 164.424 mph. 37. (97) Tanner Berryhill, Toyota, 162.955 mph. 38. (66) Timmy Hill(i), Toyota, 161.609 mph. 39. (15) Ross Chastain(i), Chevrolet, 0.000 mph.